Martin Egan of Cregboy, Shanaglish, was a top class cross country runner, who, on nationalist principles, turned down the opportunity of representing Ireland in the Olympic Games held in England in 1948. He was, during the 1940s, the winner of over 50 cross country championships in various distances at sports venues throughout the county, but before a massive attendance at the sportsground, Galway, on 18th August, 1946 he displayed his world class at a specific distance, in the 8000 metres National Cross Country Championship. He subsequently was chosen to run for Ireland in the 8000 metres race at the 1948 Olympic Games. He did not run due to reasons related to the split that was then engulfing Irish athletics, between the competing AAU and the NACAI organisations - in 1937 the NACAI was suspended from membership of IAAF because it refused to confine its activities to the then Irish Free State. By any standards, it was a monumental achievement to receive the Irish singlet from the Irish Olympics Committee. That strong character that underpinned his decision to refuse to run in the world’s athletics showpiece, set him apart in the great parade of Irish nationalists. That sacrifice of world fame was, some fifty years later, acknowledged in a letter to him by Dr. Pat Hickey, President, Olympic Council of Ireland. Martin was a man of quiet disposition, and cross-country running was second nature to all in his family. He was born on the 23rd of September 1920, just outside the village of Shanaglish. During the 1940s he and his brothers, Michael ‘Mikey’ (the eldest of the trio) and John ‘Jack’ (aged 27 in 1946), dominated cross country events at whatever distances they were made available at sports meetings – in 1945 they held 8 Irish titles between them. He was also a member of a wider family and his siblings (Jack, Michael and sister Angela) won 8 national senior medals on one day in August 1945, a feat that has not come close to be repeated since. Contemporary accounts described Martin in 1946 as ‘of medium height and stickily built with a great reserve of stamina’. In 1944, the Shanaglish Athletics Club was established, under the auspices of the sporting body, the National Athletics and Cycling Association of Ireland (NACAI), of which Martin was a member. That year, also, the country’s most enduring of sports, Shanaglish Sports, was founded. The country’s leading 56 lbs. shot putter, Ned Tobin, attended that inaugural sports meet, as well as the famous cyclists, the Mannion brothers of Moylough. In practical terms, what the Shanaglish Sports meant for its local athletes was that they were not compelled to cycle many long miles for affiliation to a club. They still had to cycle however, to the railway station at Athenry, 22 miles away, when they were to take part in sports competitions in Dublin and elsewhere throughout the country. Martin Egan’s first experience of athletics success was as a teenager at Tubber Sports. He was subsequently attracted to Feakle Athletics Club and, in 1937, he finished in third place in the County Clare Novice Cross Country Race. Sports commenters in The Irish Independent and The Irish Times took note of the times recorded in the cross country events at the Shanaglish Sports on 18th May, 1944. Their headlines declared them to be equivalent to the best times being recorded at that time and the commentators forecast that it would not be long until the Shanaglish athletes broke national records. At the inaugural Shanaglish Sports, Martin Egan won the 3 Miles Flat Race, and his brother Jack was runner-up. His brother Mikey won the 7 Miles Road Race. Martin Egan also won the 1 Mile Flat Race. In March 1944 he took first place in the Connacht Senior Championship held in Castlerea. His team won the team event. In 1944, also, Martin Egan retained the 4 Miles National Cross Country Championship title. Further, in 1944, Mikey Egan won the Irish 26 Miles Marathon Championship. In 1945, Martin Egan won a total of five All-Ireland Cross Country Championships, all over different distances at venues around the country. Martin Egan, Evening Herald, 5 Aug 1946, p.6, column 1. Irish Independent, 5 August 1946, p. 6, column 5. 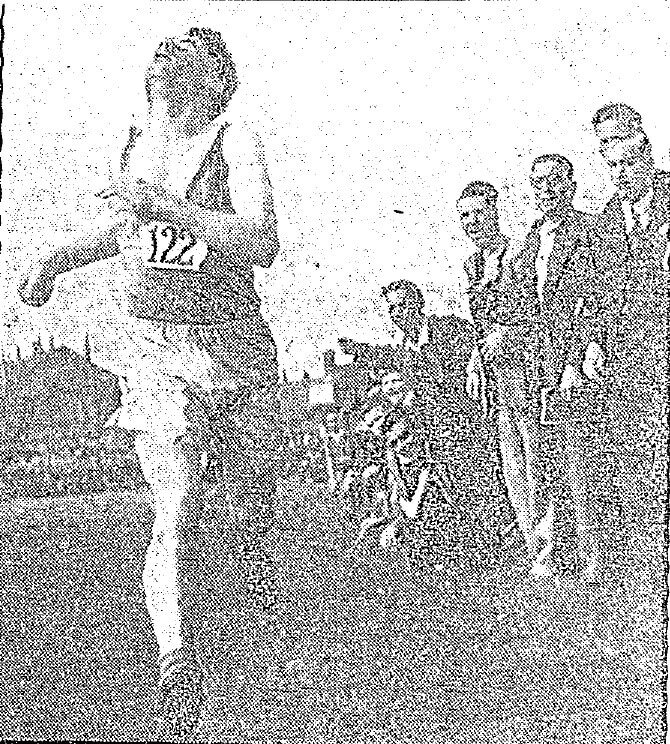 Photo of M. Egan winning the 4 miles in which he set a new Irish record. It was two years later, in 1946, that Martin Egan became a legend in cross country running. At Dundalk, on 4th August, 1946 he won the 4 Miles Cross Country Championship and, in the process, broke up the record set by Tom P. Cunniffe in 1887, aged just 26! Martin Egan’s time of 19 minutes 38.35 seconds smashed Cunniffe’s record time set at Ballsbridge Sports, 19 minutes 44.25 seconds. Gerry Kiely (Tipperary) was runner-up and Brian Bell (Dublin) was third to Martin Egan – he ran against 13 others in that race. On the last lap, Donal Appleby (Dublin City Harriers) went in to boost Egan’s pace On the morning of this event Martin walked over 20 miles to get the train to Dundalk! Other competitors in the race actually stopped competing in order to cheer him on (Tredagh’s Tom Reilly was one such competitor)! There is no doubt Martin was a tough man with great endurance – at the time he broke the record he worked in the Slieve Ardagh coal mines in Co. Tipperary. While breaking the 4 mile record, he also broke J.J. Barry’s two month old record for the 3 miles by more than 5 seconds. Interestingly, Martin also held the record for the track five mile race, which stood for 70 years (being set in 1946), until Sergiu Ciobanu of Clonliffe Harriers ran a time of 24 minutes 14.8 seconds in April of 2016! Egan was beaten into second place in the 1947 championship by his Coolquill Kickhams clubmate Mick Blake. But Egan was carrying a serious injury and collapsed in agony afterwards on the same Dundalk track. 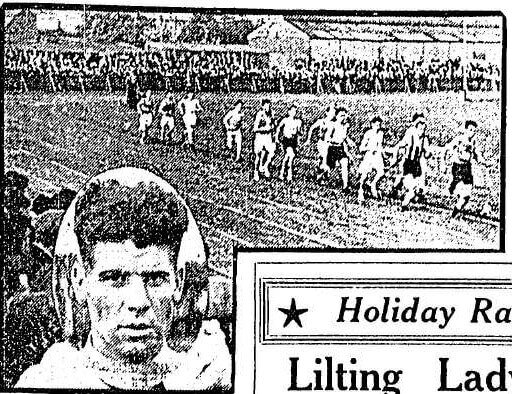 A month later Egan broke the Irish 10-mile record in Belfield with a time of 55:15 and came back in 1948 to regain his four-mile crown at Ballinasloe, turning the tables on Blake. In 1948 he might well have been considered for selection on the Irish team in the 5,000 metres at the London Olympics, but of course at that time NACA athletes were barred from all international competition. Martin represented the Galway team in cross country running until 1956. He had won over 50 cross country championships during his career. Martin Egan’s athletics achievements were accorded wide recognition in 1969 when he received the County Galway Board Hall of Fame Award. In 1976 he received the Galway County Sports Star Award. In 2000, he was honored by the Irish Olympic Council. In later years his athletics fans in Feakle presented him with an award to record his great achievements. In 2006, a party of Shanaglish AC members made a presentation to him to mark his record-breaking performance in the 4 Miles All-Ireland Cross Country Championship in 1946. Martin was always a quiet and modest man and he would only, if asked, recount tales of race meets from years gone by. In his later years he was happiest working on his farm, tending his sheep, living a quiet and peaceful life. Such was the affection and respect at which he was held, Brian Bell his long time competitor, in an address at Martin’s funeral in November 2006, recalled his friendship with Martin Egan and the course of the 1946 All-Ireland Championship Race, when he came third and Martin Egan excelled. Martin Egan is survived by his nephew, Declan; by his niece, Eithne, by other relatives and a large circle of friends. 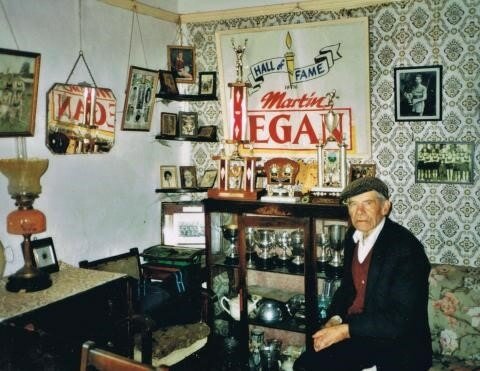 From an article online, a 32 page booklet entitled, ‘The Lost Olympian: Martin Egan, Shanaglish’, containing numerous articles about Martin and his wider family, as well as a treasure trove of photographs of Martin and his many achievements was put together a few years ago, possibly in 2014. More details on Martin Egan and his life could be obtained from Declan Egan at DeclanE2000@gmail.com . I am not sure this is still the case. Martin holds the most titles (4) in the 2 miles division (1945, 46, 49, 50); the joint most titles (6) in the 6 mile division (joint with JJ Ryan) and the most titles (5) in 10 miles (1943, 47, 48, 49 & 50). He also held the second most titles (4) behind Sean O’Sullivan in the 5 mile. Martin is number 5 on the list of those with the most medals won since 1873, having a total of 30 accolades! In 1954, Martin won 5 All Ireland Championship Medals over different distances and various venues around Ireland. John Flatley ‘The passing of Martin Egan: A giant among athletes’ Connacht Tribune, 17 November 2006, page 10. Joe Coyle ‘Athletics in Drogheda 1861-2001’ p. 83; digital image, Google Books (http://books.google.com), accessed May 2017. “Ciobanu smashes 5-mile record. Gold for Gough, Neely at Euro Masters. Cullen runs 15:26,”Lindie Naughton (http://lindienaughton.com/ciobanu-smashes-5-mile-record-gold-for-gough-nelay-at-euro-masters/), accessed May 2017. Michael O’Neill, “Martin Egan Memorial 10km Road Race,” SportsNewsIreland (http://sportsnewsireland.com/uncategorized/91538/), accessed May 2017. “Martin Egan Memorial 10KM,” Runners World (http://www.runnersworld.com/race/B893C7EF-C9BD-4201-A8B5-925F4D2A94C4/martin-egan-memorial-10km), accessed May 2017. “Martin Egan Memorial 10KM,” RunIreland.com (http://www.runireland.com/events/martin-egan-memorial-10km-beagh-10km), accessed May 2017. “Track Legend Egan Dies,” Sport, The Irish Times (http://www.irishtimes.com/sport/track-legend-egan-dies-1.1027352), accessed May 2016. 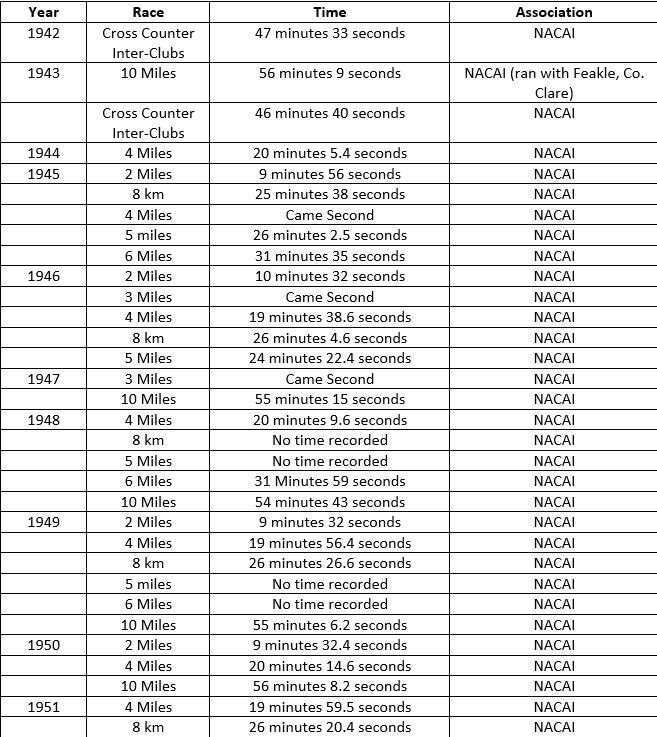 “Roll Of Honour Irish Athletics Champions 1873-2013,” FinnValleyAC (http://www.finnvalleyac.com/2013/130726/ROHOutdoor.pdf), accessed May 2017. Irish Independent, 5 August 1946, p. 6, column 5.